Is it possible to make green fireworks? Amount of fireworks sold to individuals for personal celebrations: 252 million pounds [up from 102 million pounds in 2000)]. Amount of fireworks sold to cities and municipalities for public celebrations last year: 25 million pounds. Now if you think about the chemicals required to make all of those stunning explosions, and then think about those burning up and getting into our air, ground and water... well, it can be somewhat heartbreaking. But there is hope: apparently greener fireworks are being developed. Some of the improvements include: nitrogen-based fuels to reduce the amount of smoke produced and air-launch fireworks (no gunpowder required). 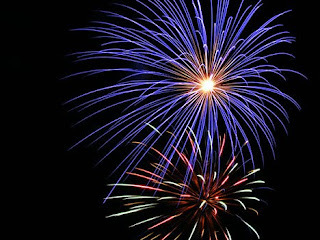 Naturally (pardon the pun), greener fireworks are more expensive but hopefully they will become more popular over time.